Candy Bianca is one of the protagonists of the ADI Design Index 2018, dedicated to the recently launched best design products. The exhibition is a pre-selection of products that will compete for the “Compasso d’Oro” award: after the exhibition in Milan, hosted from 16 to 21 October at the Leonardo Da Vinci Museum of Science and Technology, Candy Bianca will be exhibited in Rome from 21 November to 5 December at the Acquario Romano. Bianca has convinced the members of the permanent Observatory of ADI Design, a panel composed of 100 experts among researchers, specialized journalists and designers: it has been considered one of the most interesting products launched on the market in the last year, thanks to its captivating image and premium features. 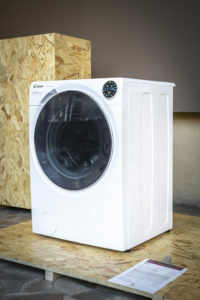 The washing machine has the “Talking Bianca” function and Smart Ring interface, and is able to communicate with the customer service to identify potential problems. “Bianca is one of Candy’s most successful products in recent years – says Aldo Fumagalli, Candy’s Head of Washing Appliances Business Sector and Connectivity -. Being selected by the ADI Design Index and competing for the Compasso d’Oro award makes us proud and aware of the fact that we are going in the right direction. Bianca is a product that fits perfectly into the line of Smart Innovation, which for us translates into the ability to market products that can have a real and authentic impact on people, making everyday life easier”.